Old-timer car enthusiasts might have fun with these pages where I tell about my 1942 Dodge pick-up and my 1968 Volvo Amazon. I’m always ready to make the acquaintance of other cars and their drivers and, naturally, I’m a member of a variety of clubs. I’ve had no technical education but since my first encounter with a toy hammer and nails in my infancy I have not been able to withstand the temptation to tinker with machinery. I found the Dodge in a field in Kansas in the summer of 1995 while on a tour through the States with my folk band Folkcorn. The vehicle landed in the Netherlands in early 1997, was disassembled, repaired and put together again by myself and a group of friends and has been on the road again since mid-1998. We use the Dodge regularly for trips out, for transport and as a stage for concerts. The American old-timer publicist Don Bunn devoted an article to my Dodge in the January/February 2001 issue of the journal This Old Truck. To my great delight the American forces left behind a great quantity of Dodge spare parts after the Second World War, stored in army dumps all over Europe. A great part of the inner works of my civilian truck matches the military versions. . . Believe it or not: within a radius of 6 miles around my home there are two gigantic army dumps where I can buy engines, brake parts and other components still new or as good as new! The Volvo happened to be waiting around for me when, long ago, as a student in Amsterdam, I was looking for something to drive (I turned out to have to do something with this particular vehicle before it actually would…). 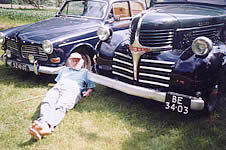 Before that I had shared, with a girlfriend, a Simca Fourgonette – actually an old-timer in its own right – that had been got rid of by the postal authorities. But the Amazon was the first car that was all my own, my very own. I felt like a king! Great car, the Amazon. Designed by an artist – and you can tell! I’ve been the proud owner since 1986. It starts if you nod at it. 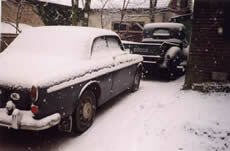 My old-timers are intensively used: we use them for transport, for parties, for weddings and funerals. I’ve written a great deal about both vehicles, including articles in my club magazines. The writings- for the time being only available in Dutch – can be ordered via the poetry page of the Dutch version of this website. I’ve spread my poetry and prose over several dozen mini-books. What I’ve written about my Volvo can be found in booklet no. 35, while the praises of my Dodge are sung in no. 36.